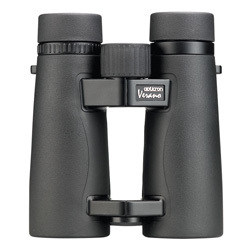 The Veranos have long been a strong selling binocular in Opticron's vast range, released initially back in 2003, the Veranos soon made their mark as one of the best performing binoculars in its price range. The 2010 BGA PC Oasis are a much improved version, with the Oasis coating considerably improving light transmission and image clarity. The new open-bridge design also makes the Veranos a very comfortable binocular to use. For the review I will be using the 8x32 and 8x42 models, though 10x42s are also available. The overall review and score is for both models, though each is mentioned in specific details where applicable. Optically these binoculars produce a pleasingly bright and sharp image. The 8x32s offer an impressive 7.5° field of view, with the 8x42s at an average 6.2°. With the 8x32s this provides a lovely wide angle picture so you don't miss anything and with both models the detail was retained right to the edge. The wider end diameter on the 8x42s does allow more light to enter, however, so although there seemed to be a negligible difference you might find the larger pair produces a brighter image. Opticron state the close focus is 1.5m and 1.8m on the 8x32 and 8x42 models respectively, though I found you could get to almost within 1m with the smaller pair. The real test for any binocular is how they perform in low light, and the Verano's proved to be very capable. The Oasis coating applied to these Binoculars help to maximise colour contrast in all light conditions, so even at dusk in the field test I could still pick up plenty of detail with both models. The first thing you notice when picking up a pair of Veranos is just how light they are. With the body made from polycarbonate and alloy, the 8x32s weigh in at 524g and the 8x42s at 654g. There are undoubtedly lighter models on the market, especially in the 8x32 size, but the build quality on the Veranos feels incredibly strong for the weight. There are no cheap plastics used and everything from the twist type eyecups to the double hinge feels rugged - the 30 year guarantee backs up that notion. In terms of comfort these binoculars couldn't rate any higher for me. Aesthetically the open-bridge design does make these binoculars rather nice to look at, but more importantly it makes them incredibly comfortable and easy to use. Even one handed operation is simple; the durable textured rubber body gives ample grip with your index finger free to focus. The revised house-style wide wheel focusing system was impressive and I could quickly move from one end of the scale to the other. Overall the 8x32s (right) suited my (rather small) hands perfectly. For the average user the 8x42s (top) might perhaps feel a bit more balanced as they offer more space to rest your fingers on the barrel. Verano BGA PC Oasis binoculars are supplied complete in soft neoprene case with rainguard, neoprene lanyard and objective lens caps. 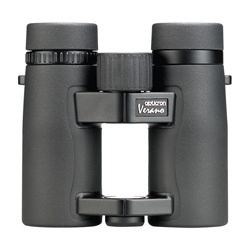 Certainly nothing to complain about here, the soft case and padded lanyard are expected in this price range but are none-the-less welcome additions and make carrying these binoculars around a pleasure. The Veranos also come with a professional series micro fibre cleaning cloth, helpful for catching trapped dirt without any worries about scratching the glass. As mentioned previously, the Veranos include a 30 year guarantee owing to the fact they're made in Japan. Retailing at £329 for the 8x32s and £339 for the 8x42s (correct as of 31/01/12), these binoculars aren't in the budget market but equally are not a hugely expensive pair. For the style conscious bird watcher these bins certainly fit the bill, but how do they score overall? Quite simply I have very little to pick at with the Verano BGA PC Oasis 8x32s. In my opinion they set a high standard for their class, producing a very bright image with a very wide field of view built in to an incredibly comfortable, well built body. The field of view on the 8x42s leaves a little to be desired, though they're still a very solid, comfortable pair of binoculars that produce a nice bright image. I was impressed by both throughout and would certainly feel comfortable using either in the field, though for me the 8x32 edged it by the wider image they produce.